Click here to search our online archive for documents and images associated with this building. The DeTurk family is of French Huguenot descent and is descendant from Isaac DeTurk who immigrated to the Hudson River valley in New York in 1708. Isaac was from Picardy in northern France. In 1685, the Revocation of the Edict of Nantes occurred prompting Huguenots throughout France and Alsace-Lorraine to begin fleeing into areas such as England, Holland, Switzerland, Germany, Sweden, Italy, and even Ireland. After the Protestant persecution in France, Isaac opted to flee to America after living for a time in the Alsace-Lorraine region of Germany. The DeTurks were among the many Huguenot refugees who eventually made their way to America. In 1712, Isaac came to the Oley Valley from New York. Johan DeTurk was the only son of Isaac DeTurk and was born in 1713. He married Deborah Hoch in 1740 and they had twelve children. Among the DeTurk children, were Revolutionary War soldiers (one of whose equipment is on display at the New Jersey Washington Crossing State Park). Also, son John was the third owner of the old Boone farm where Daniel Boone was born. There are currently many DeTurks buried in a family plot at the Daniel Boone Homestead State Historic Site. Johan and Deborah DeTurk were elderly when they moved into the ancillary building on the family farm. The 1759 tax list has Johan DeTurk paying thirty-five Pounds in taxes. In 1876, a J.D. DeTurk was listed as a carpenter and a George S. DeTurk was listed as a farmer. 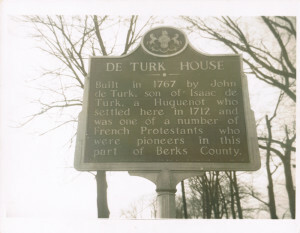 With Johan DeTurk apparently being of Moravian faith, the DeTurk farm became the center of Moravian activity in the Oley Valley during the time of Count Nikolaus Zinzendorf. Zinzendorf was a bishop of the reformed Moravian Church and was active in the Moravian population around Bethlehem. Zinzendorf was born in Dresden in 1700 and had arrived in Philadelphia in 1741. He held a series of conferences whose purpose was an attempt to unify the various German branches of religion (Moravian, Seventh Day Baptists, Dunkards, Separatists, Lutheran, Mennonite, and Reformed). 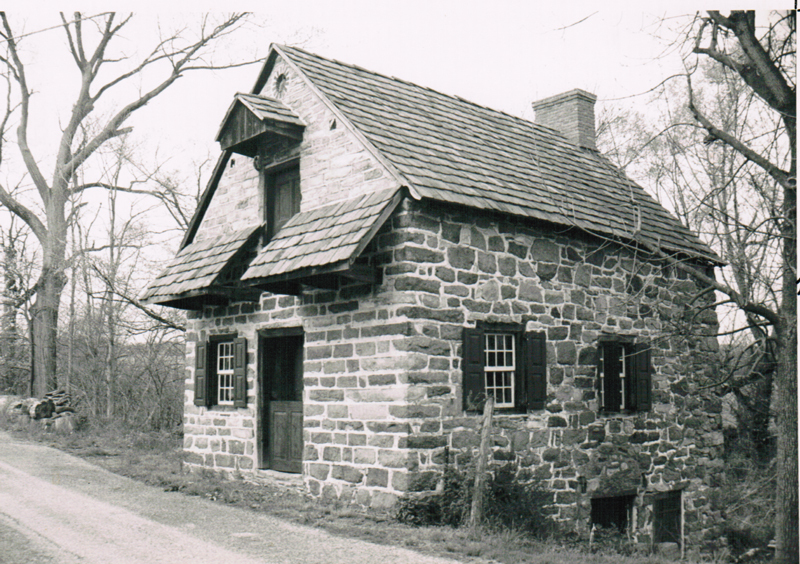 The third of Zinzendorf’s conferences was held at the DeTurk farm in the Oley Valley. The Oley Conference took place on the DeTurk property (possibly in the stone barn) from February 10-12, 1742. One significant accomplishment of the conference was the first Native American (three Mohicans from New York) baptism by the Moravians. Near the farm was also an early Moravian school. Although these activities did not take place in the ancillary house proper, they are significant to the history of the property with which this building is associated. Count Zinzendorf died in 1760. Isaac DeTurk also took part in local political maneuverings. A petition for the creation of the Oley Road was signed by Isaac DeTurk in 1717. Apparently, however, the road was not approved until 1719. It is believed that modern-day Route 662 is the Oley Road. The northern-most stretch of the Great Road from Oley to Philadelphia would have been the road that runs from Route 662, along the creek, and past the DeTurk house. In 1720, Isaac signed the failed petition for the creation of Oley Township. Oley Township was not created until 1740. It seems that by the mid to late 19th century, the old ancillary property no longer had a significant function. A 1935 Reading Eagle article stated that the structure was the home for a family of hogs. It had also been used to house migrant workers. Located near Oley very close to the Manatawny Creek, it was an ancillary house located on the property of Johan and Deborah DeTurk. Johan had built the larger stone house which is located across the street. It was later in life that Johan and Deborah built and moved into this more modest ancillary house. The doorway lintel has the inscription “Johan DeTirck—1767—Debora DeTircken” inscribed on it. 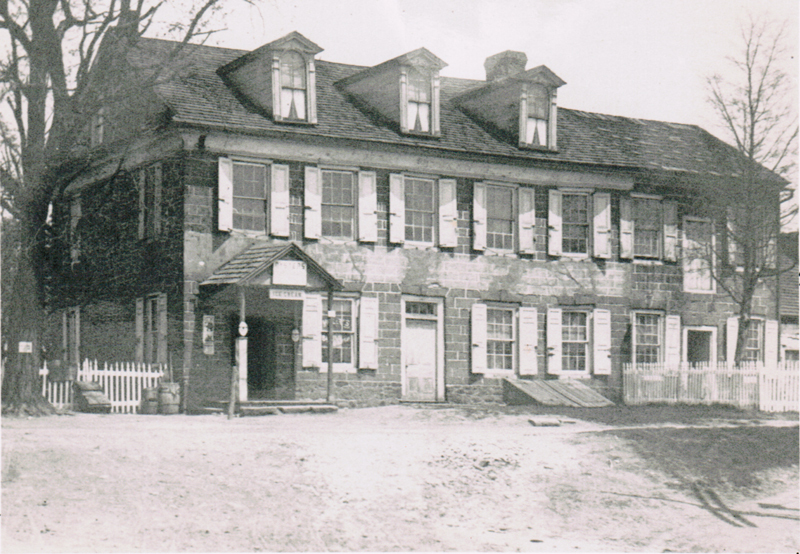 The building is an example of the Huguenot and Germanic influence on the Oley Valley and is a bank house. The structure is a one and a half story, one-room plan building. There is a gable end entrance with doors and shutters with painted bird and flower motifs. At least in 1931, there was an interior wall cupboard that also had a painted decoration. These painted motifs are also reflected in Pennsylvania German painted blanket chests of the same period. The ground floor consists of a vaulted cellar with a kitchen on the north end. The cellar proper is separated from the kitchen by a stone wall. There is no staircase to the first floor. The chimney at the rear of the structure services not only the kitchen fireplace, but also the smaller fireplace on the first floor. The first floor is a single room with a narrow, unfinished winding stair (not an original) to the attic. The attic is an open space. There is no significant trim work (i.e. chair rails, cornice, and base boards). There is a massive chamfered summer beam in the building. This seems unusual since the building is small enough to be spanned by joists. However, if heavy objects were being stored upstairs, the summer beam would become a necessity; this could account for the loading door at the attic level in the gable end. 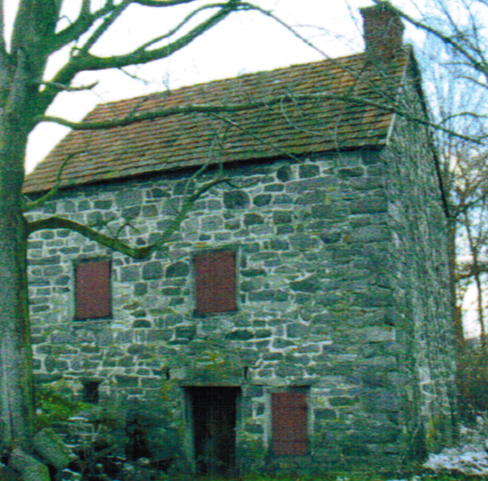 With a door and pulley, the garret was utilized as a granary. The clay tiles for the roof were hand-made. The pent roofs of the building are open on the end. According to Ken LeVan, this is a virtually absent feature in this region which is quite common in Europe. At some point, a large truck sheared the pent roof off the front of the structure. An addition to the west which was connected at the first floor with door cut through the west wall was removed at some point. Also, the original roof construction has been replaced. A bake oven opening has also been closed up on the west wall with stone. Originally, the ground floor exterior door would have had a hood over it. Much of the original pointing remains and there is a section of original plaster extant on the first floor. The second story door is a replacement which closely copies the original. All the shutters have been replaced. The Historic Preservation Trust of Berks County completed a restoration on the structure using funds from the Women’s Club of Oley in the late 1960s and early 1970s. In 1991, Lester Breininger made twenty-five roof tiles to replace the ridge tiles for the roof. In approximately 1712, Isaac DeTurk moved to the Oley Valley and purchased three hundred acres near Friedensburg or present-day Oley. In 1725, Isaac DeTurk owned 300 acres and a homestead. DeTurk’s rent for this land was 10 Pounds per 100 acres plus an annual quit rent of one shilling. The 1734 tax list also lists Johan DeTurk (son of Isaac) as owning 300 acres. Even though his mother was still alive, it appears that son Johan was running and/or owned the same amount of land by 1750 and still owned it in 1775. Johan inherited the large family farm in 1761 after his mother’s death. Well into the 19th century at least, DeTurk descendants continued to own the family farm. The 1854 Berks County Atlas shows a J. DeTurk as the resident, and the 1862 Berks County Atlas lists a Johan DeTurk for the property. By 1958, the property was owned by Dwight Moyer and William Gotwalls and was vacant. 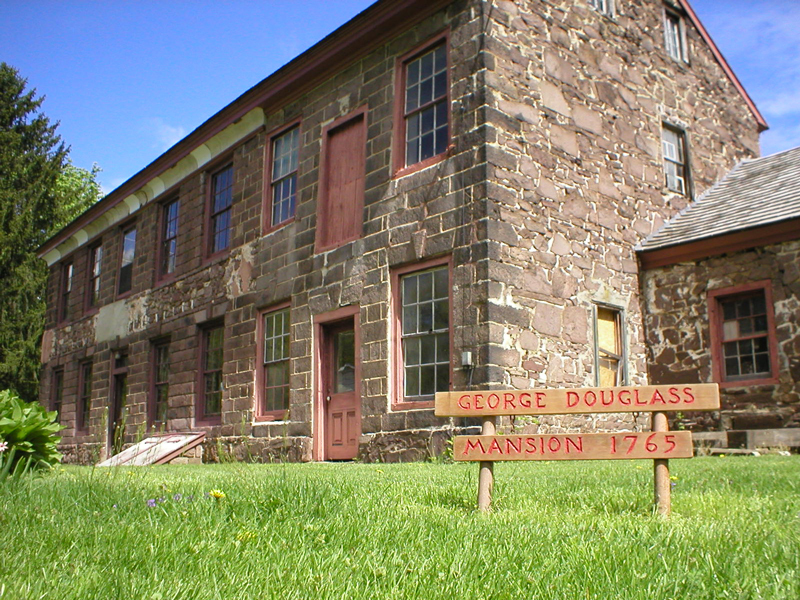 In 1967, the Historic Preservation Trust of Berks County obtained a 100-year lease on the property from the Gotwalls family. Funds were obtained from the Women’s Club of Oley. The Johan DeTurk cabin is open every day by advance appointment only. Please contact the Trust office at least 14 days in advance of your trip to make an appointment. Whenever possible, please supply 2 alternate appointment dates. From Rt. 12 (Pricetown Road), take Rt. 73 East 3.8 miles. Turn right to DeTurk Road. As you turn, you will see a historical marker on the left-hand side of the road. Proceed on DeTurk road to the “Y” in the road. Turn right onto Historic Lane. Go 200 feet to the cabin. 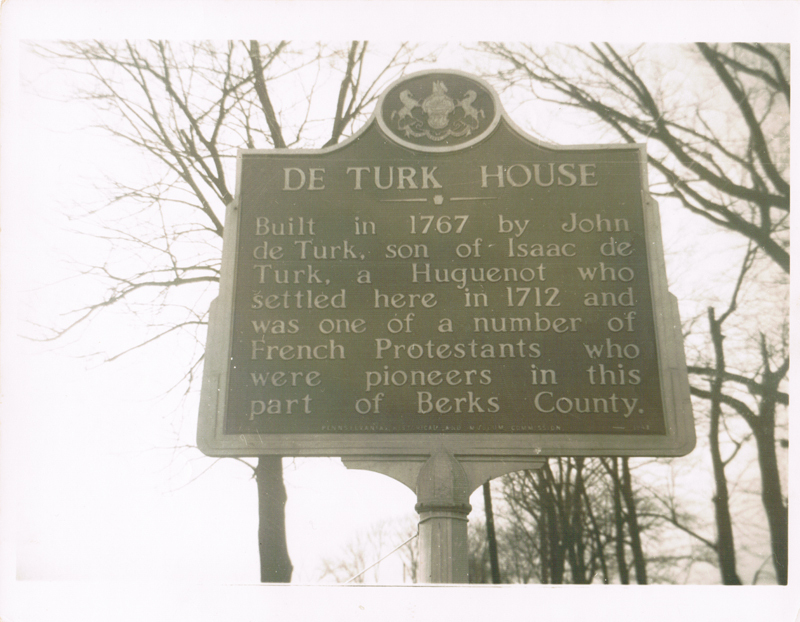 Interested in learning more about the Johan DeTurk Cabin and the Historic Preservation Trust of Berks County? Search records, pictures, images, architectural drawings and more in our Online Archive .